INDIANAPOLIS (AP) Graham Rahal’s one-day turnaround looked good and felt even better. Now he needs to prove it wasn’t a fluke. Just 24 hours after finishing 34th out of 35 on the Indianapolis 500 practice speed charts, the 29-year-old American jumped into the top spot with a fast lap of 226.047 mph. The only driver to top 226 on Thursday heads into the weekend with a little momentum. Rahal had been struggling to figure out how the new car works. He was clocked at 222.102 on Wednesday. He’s not the only one searching for answers. Tony Kanaan, the second-fastest Thursday at 225.896 and the 2013 race winner, acknowledged everyone’s curious to see what happens when series organizers boost the horsepower by about 50 on Friday and for qualifying weekend. He’s driving for A.J. Foyt Racing this year. But he also didn’t wind up in the wall like JR Hildebrand, who suffered the first crash of the week when his car drifted up the track and slammed into the wall between the third and fourth turns. 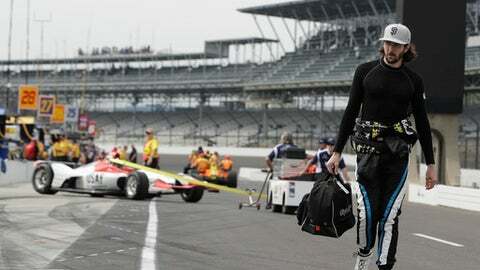 He was checked at Indianapolis Motor Speedway’s infield center and was released and cleared to drive. It put a damper on Dreyer & Reinbold’s first attempt to make the 500 since 2013. Rahal said he had similar sensation in his car throughout the day and thought he might be the first to crash, too. Instead, he managed to get some help to jump to the top of the speed charts. Rahal, who drives for his father’s team – Rahal Letterman Lanigan Racing -was one of two Honda drivers in the top six. The other was Marco Andretti, who was third at 225.584. Andretti, who also drives for his father’s team, had the fastest speed Wednesday. Two-time Indy 500 pole winner Ed Carpenter, Sage Karam and 2017 series champion Josef Newgarden rounded the top six. They, along with Kanaan all drive Chevrolets. Danica Patrick was 30th at 222.216 as she prepares for the final race of her career. Practice continues Friday when the cars get a horsepower boost. Qualifying for the traditional 33-car starting grid will be held Saturday and the nine-car pole shootout is scheduled for Sunday, one week before the race.